Cloud computing is an industry buzzword regurgitated like a hiccup that won’t go away. Everything is moving to the cloud - so what does this mean for us people back on earth? First, a bit of background. Cloud computing, if you’re not familiar, can be described as a set of services that let people run programs on virtualized hardware located remotely from their actual machine. 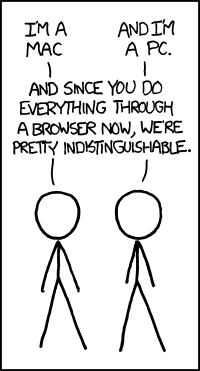 Think of every webpage on the internet. What makes cloud different from traditional hosting is that in addition to providing web servers, a cloud provider also provides autoscaling, load balancing, database replication, content distribution and the rest of the kitchen sink, dining room and basement (they’ll even rain proof the roof). What you end up with is access to ‘unlimited’ amounts of computation and storage optimized for traffic and fault tolerance at a global scale - this all at a low pay as you go rate. Some notable companies using the cloud include Dropbox, Pinterest and Netflix (accounting for 33% of all downstream traffic in north america as of 2012). The cloud has already transformed how companies do business on the internetand makes it possible for anyone to run a world scale service. Next, I believe that the cloud will transform how consumers interact across the digital divide and redefine our conception of a personal computer. Personal computers have already changed a great deal. Their very existence marks a big turning point in human history. When Microsoft was first founded, Bill Gates made it the company mission to put “a computer on every desk and in every home”. When Gates made the statement, Microsoft didn’t even make computers and the public didn’t see the use for them. Fast forward to today and personal computers are ubiquitous. Having one has become not a luxury but a necessity. The face of personal computing has changed drastically with the coming of the smartphone. For better or worse, the smartphone is a device that gives you access to your digital assets anywhere you need it. By being on your persons at all time and connected to the internet, smartphones have expanded the range of services that a personal computer can provide, everything from giving turn by turn directions to measuring the amount of steps you walked in a day. The next step in “personal computing” is to completely remove this idea of a computer being a physical device and go completely to the way of the cloud. If you think about it, what is a computer really? It’s a machine that can perform some sort of calculation, remember the output of those calculations and perform new actions based on the output (ala Turing Machine). Personal computing is a computer with all your data as inputs and all your programs as agents that do calculations on your inputs to produce new outputs. Your personal computer is just an implementation detail - at the end of the day, what you’re interacting with is your data. Before, your data was tied down to the box that you used and the programs tied to your operating system. Today, web services and cloud storage have blurred the boundaries of what is local and what is not. Data syncing programs like Evernote and Dropbox keep your data up to date between all popular platforms. Programs such as photoshop and office are being re-architected as cloud services that will run in a compatible manner across all popular architectures. What this means is that your data will no longer be tied down to the hard drive on your laptop but safe “upstairs”, geo replicated across data centers in multiple continents. With your data consolidated in one logical location and computation offloaded to the cloud, anything with an internet connection can be the gateway to your “personal computer”. Today we think of computers as desktops, laptops and phones. Tomorrow, we’ll see a proliferation of new devices in every form and shape that will supplant what we have today. Glasses, jewelry, automobiles, wristband displays - in the future, your personal computer will be a part of every device that you interact with. It’s going to be a brave new world. As a footnote, I realize that this entire post makes no mention of the security and privacy implications (or our society’s increasing dependency on technology) of this brave new world. These are very real issues that need to be addressed. Adding more security won’t be enough - we also need to draft new legislation of what privacy and property mean in the digital era. But alas, I’ll save that rant for another day.